This is it. The big one. 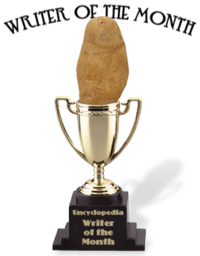 The Oscar of Uncyclopedia. Writer of the month. The "Chronies", if you will. And it is the Voting page. 2 Whom should I nominate? Not nominate yourself. You can vote for yourself, but you can't nominate yourself. Have written at least five "full" articles. Nominate the member who has written the funniest, highest-quality stuff in the past month. Nominations end one week from the end of the month. Over the course of the month you may vote ONCE for your favorite writer. Do your research! Vote for who makes you giggle immensely. On the first of the next month, the winner will be announced. Fancy template to put on your user page. 1 gallon of ice cream! Only 1 gallon? What a rip off! We can make it a pint. Nominate now! Only signed votes will count. Please use the level two headline format for the name of the nomination with an optional comment and mandatory signature underneath. You must get a minimum score of +5 to pass muster. Crowdsource, call in sexual favors, whore to your heart's content in order to get this number. Just don't make socks or vote twice. Or whore. Sorry I said that the first time. This page was last edited on 9 December 2016, at 20:23.